Eva Preston is a mixed media artist who makes art into fashion and fashion into art. Her goal is to up-cycle materials she finds into works of art that extend the life of the materials that would likely end up at the dump. That’s why she’s an integral member of the famous Dumpster Divers of Philadelphia. ‘The Dumpster Divers of Philadelphia are a group of over 40 found object artists, their artwork as diverse as the group and materials used. They were officially recognized with a 2012 City of Philadelphia Mayor’s Tribute for “helping to raise the consciousness of art lovers and heightened awareness of taking a creative approach to support a more sustainable city, country and world.’ Eva is also on the board of directors of the Philadelphia chapter of The Women’s Caucus for Art whose mission is to to create community through art, education, and social activism. The art she creates is enigmatic, mysterious, sensual and metaphoric from up-cycled handbags decoupaged with historical figures from R&B artists James Brown and Billy Holiday to Philadelphia opera phenomenon Marion Anderson. Collaged artworks with ethnic memes and art objects made from disparate pieces of junk are transformed into desirable objects and fashions like no other. The results are as serious and deep as a history lesson yet fun and fanciful as a fast dance. Eva is an artist who cares about society, the plight of women and children and communicating the stories of those who can’t speak for themselves. But, she is a fierce fashionista who loves to look beautiful, wear stylish clothes and quirky accessories like a rock star. And she’s a loving grand-mom who would really rather play on the floor with the kids. When you’re around her there’s an aura of happiness, love and compassion that has a vibrance and vivacity that enlightens the world with her personality and her artwork. I wrote about Eva’s work with The Women’s Caucus for Art Philadelphia in DoNArTNeWs back in April 2012 for their Stop Slavery Now: A Conversation About Human Trafficking fundraising campaign. The group makes rag dolls to raise awareness and funds to help stop human trafficking and her art has even been selected for WCA International Caucus & United Nations Art Program. A work of art created by Eva Preston and Joanna Fulginiti on behalf of The Ragdoll Project was chosen to be included in Half The Sky, an exhibition to be presented at LuXun Academy of Fine Arts Art Gallery in Shenyang, China, April 2014. Currently you can view Eva Preston‘s art at The Art Gallery at Philadelphia City Hall and at The National Archives. 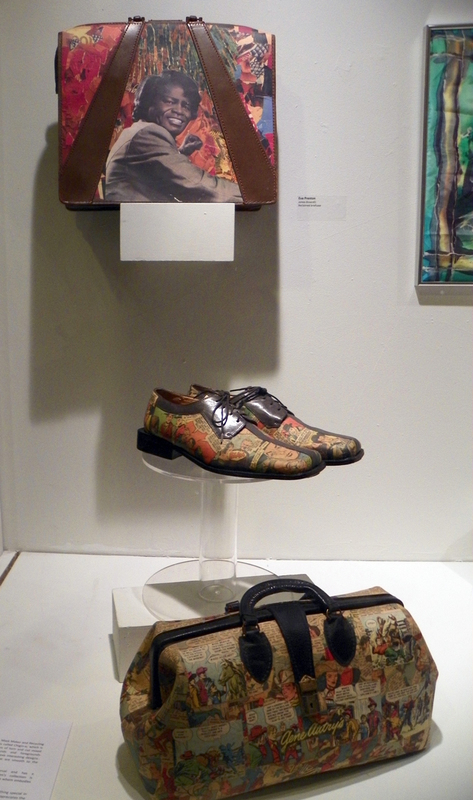 In both shows Eva is presenting fashion accessories that are decoupaged with printed paper from classic comics to the U.S. Constitution on clothes and accessories. The Archives Alchemy show at the National Archives uses materials the archives were disposing of after digitally archiving or simply because they were disintegrating. 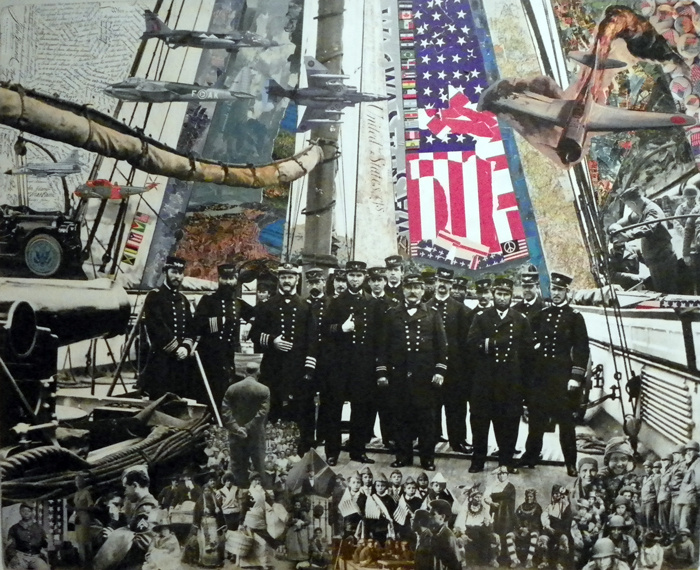 The large collage called The Boat Ride looks like it has always been hanging in the room, the historic resonance feels authentic, telling the story of how Americans became American, The pieces in the ECO+FASHION show at Art in City Hall are fabulously attractive and fashionable yet they use very humble, recycled materials to create a vibrant style statement. For me, the men’s shoes are a stand out. Fashion is usually about women but here Eva shows how much she loves men and wants them to look not just good but smoking hot. The shoes pay homage to super-heroes, historic figures and comic legends representing all that men can be. 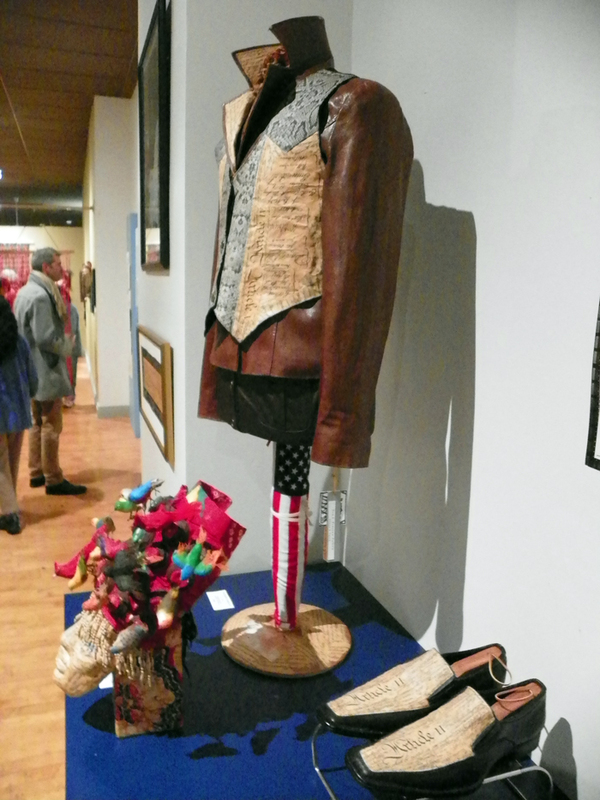 Eva Preston, ECO+FASHION, The Art Gallery at City Hall, Philadelphia City Hall, Broad and Market Streets, Room 116, through February 28th, 2014, Classic Comic ‘s Cowboy Style!!! 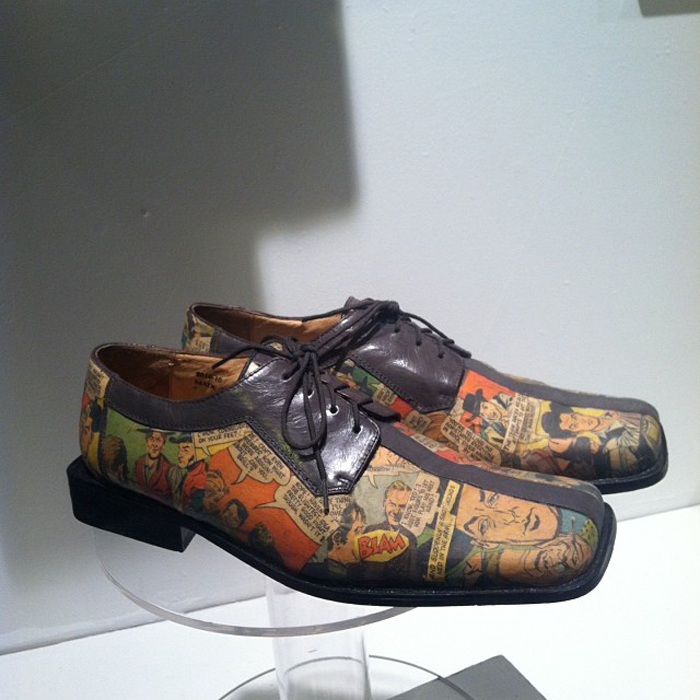 Men’s shoes, leather with decoupage comics. “Eva Preston has distinguished herself as an exhibitor of many Art forms. She is famous for her Mixed Media Art. Eva’s art is made from recycled materials, found objects, textiles, photos and torn paper. She tells stories through her artwork with unique patterns, shapes, architecture and construction. She is a self-taught artist from Philadelphia and a hands-on visionary Artist. As a Collector and Historian, Eva dives into the past and retrieves old prints and photographs. She is also a Set Designer, Mask Maker and has taught Mask Design in high schools, art centers and colleges. Her techniques are seamless and smooth to the touch and eye. Eva Preston, Archives Alchemy: The Art of the Dumpster Divers, through April 24, 2014. 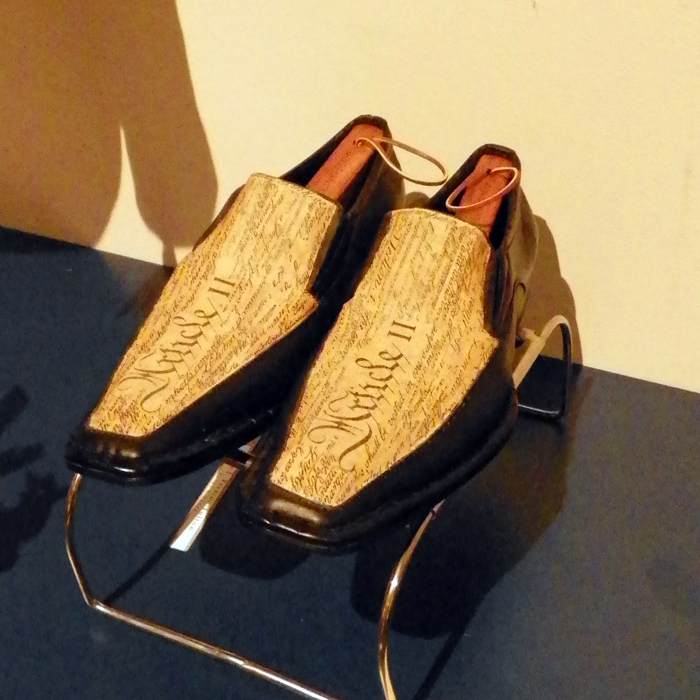 Men’s shoes, leather with decoupage U. S Constitution, Article 11. Eva Preston is an artist, philanthropist and activist who helps us shed the veil over our eyes to bad things in the world through beauty and love. We have to help stop slavery, so she makes rag dolls. We have to end discrimination, so she shares her history and facts in her art. We all need love, so she shares it freely with her friends and the world. We have to stop destroying the world, so she collects the discards and turns trash into treasure. Thank you Eva for making the world a better place to live.